Scientists have long been stumped by a single riddle—the black hole information paradox. It asks what happens to matter that’s swallowed into a black hole in space. Where does the information about the previously existent stuff go when matter “disappears” into a hole? Is it possible that it’s irretrievably lost? Or is it stored somewhere, and if so, wouldn’t this make one black hole distinct from another? Now, they believe they may know, or at least that they may have clues to solving this riddle. In a paper by colleagues of cosmologist Stephen Hawking, called “Black hole entropy and soft hair” uploaded to the arXiv preprint server on Oct. 3 and updated on Oct. 9, researchers from Cambridge University in the UK and Harvard University in the US discuss their work with the legendary scientist just before he died last March. They argue that information about matter is stored in “soft hairs” on the event horizon of a black hole. Black holes are places in space that we can’t see but know exist because of the effect they exert on nearby stars. In these places matter is intensely compressed and gravity’s pull is so strong that even light can’t escape. These mysterious holes raise a lot of questions and have led to a scientific war of sorts. Albert Einstein argued in the early 20th century that black holes are indistinguishable from one another. They can only be characterized by their mass and spin but contain no unique distinctions indicating the traces of what they’ve taken in. This is called the “no hair” theory, and it likens black holes to bald heads. But it presents a problem because according to the laws of quantum mechanics, nothing can just disappear without leaving some kind of trace of its previous physical state. That raises the question of what happens to information about the matter sucked into black holes. Later in the 20th century, Stephen Hawking posited that black holes are distinct from one another and have an added characteristic beyond mass and spin—they have unique temperatures that can be measured. In 1974, Hawking argued that black holes don’t just swallow everything but also emit radiation before eventually evaporating. If black holes have distinct temperatures, this implies entropy, which is the measure of an object’s internal disorder, a number that rises with heat. Hawking’s theory of black hole entropy raised doubts about the no-hair theorem. Yet he still believed the information about matter taken into the holes was lost forever. In 1981, Hawking argued that within black holes are other virtual black holes that flash in and out of existence very quickly and that they erase the information about matter subsumed by the holes. His theory led to the “Black Hole War,” according to theoretical physicist Leonard Susskind in his 2008 book by the same name. For a quarter century, Susskind and Hawking and other renowned theoretical physicists had competing notions about lost information. Not everyone agreed with Hawking’s idea that matter could be lost. In 2004, Hawking decided that he was wrong and that information might not be lost after all. In 2007, he paid off a $1 bet made in 1980 with physicist Don Page. Hawking’s concession was humorous. “I concede in light of the weakness of the dollar,” he wrote on April 23, 2007. But the problem presented by the information paradox wasn’t solved: It still wasn’t clear what happened to matter subsumed by black holes. But an answer might lie in entropy, the original measurement Hawking proposed to better understand black holes in 1974. The physicists worked on the paper with Hawking during his final days. 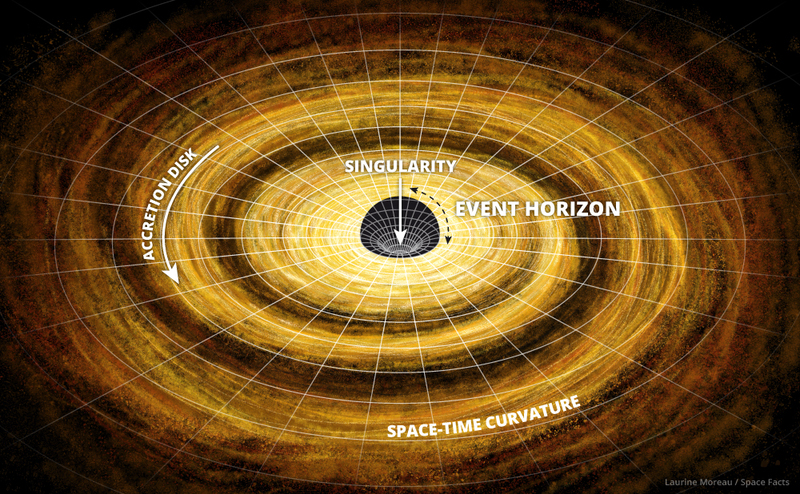 It argues that Hawking’s original 1974 calculation of black-hole entropy corresponds to their calculations of soft hair entropy. They believe that at a black hole’s event horizon, or the point at which light can’t escape gravitation pull, soft hair holds the traces of information about matter that seems to disappear into the black hole. The riddle’s still not solved, however.